One of the most powerful tools for businesses is still underutilized in today’s market. And that tool is Twitter. The significant push toward both social media and branding has made it nearly impossible to avoid this social space. Whether you’re educating customers about your product or service, reaching a new audience or promoting your brand, Twitter is one of the most useful places to be to achieve your marketing goals. When brands steer clear of Twitter, they usually use the excuse that they don’t know how to use it. Businesses also feel the network can be overwhelming for a single person. While some marketers might not have room on their plate to manage multiple social media accounts, there’s no excuse for being inactive on Twitter as a business. While this is the most obvious step, simply making a Twitter account is a crucial part to being active on social media. 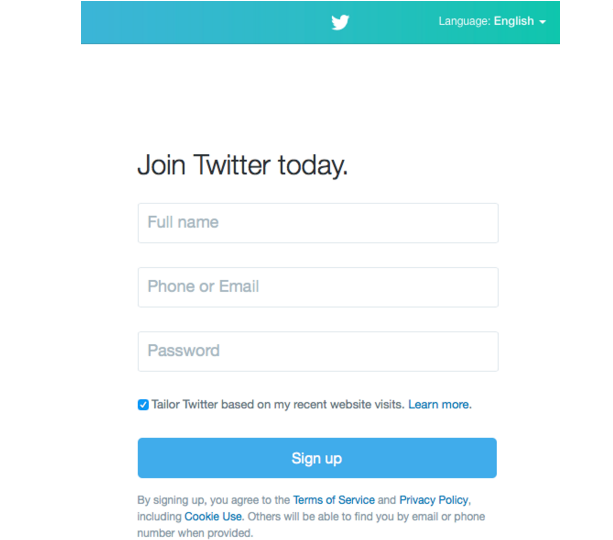 At Twitter’s site, you just enter your name, work email and create a multi-user friendly password for the account. Once you’ve signed up, you begin filling out some information for the rest of your account. Don’t be afraid to enter your name and work email on certain questions. These features are changeable and easy to format for your business. Once you’re ready to pick a Twitter Handle, remember the shorter the better. You want to be searchable for your customers and others in the industry. You want to get into the practice of making everything short and concise on Twitter because you only have 140 characters to use. Additionally, you want to think about when customers or other users reach out to. When they @mention you or reply to one of your posts, your username will take up some of the characters for the response. It’s always best to keep usernames limited for this reason. You can change your username later. Your Twitter password should contain letters, numbers and symbols. Confirm your account before trying to personalize. Log out of your personal Twitter account before creating a new one. Like any social media network, it’s all about connecting with other users to share content. Luckily, Twitter is great spot for new users to build connections and the network even gives you a head start to find influencers. Twitter allows you to connect with others as soon as you fill out your profile. You’ll receive recommendations on who to follow, whether it’s celebrities, athletes, comedians, business leaders or musicians. However, you can browse for people that would match your business’s interests. 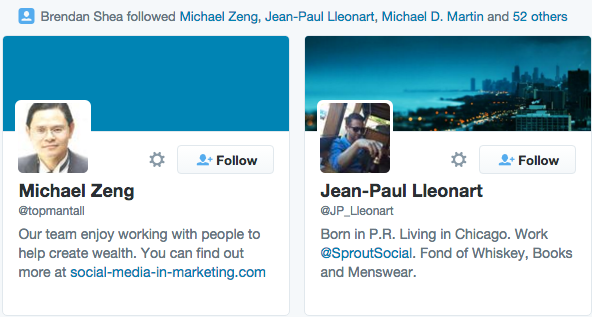 Once you begin to add people, Twitter provides helpful suggested users to follow based on your previous selections. Additionally, you can see related users when you’re on someone’s feed you follow. The process is extremely easy and unlike Facebook, Twitter is a great spot to add people you don’t quite know. The social network is more about building connections than intimate or personal networks. So you’ve set up a Twitter account and followed new people–now what? This is the best time to add some flair to your account. You don’t want the users you just followed to come to your profile only to see something that looks abandoned. Simply click “Edit profile” on the right side of your screen below the header on your profile. Your profile picture should be something that’s clear and distinguishable even as a small icon. It doesn’t hurt to upload a larger image, but Twitter will shrink it down to size. As for the header photo, you will have much more room, so pick something visually striking. All the top businesses that operate on Twitter use appealing photos to engage readers on their profile. From this same screen, you can update basic profile information. You can catch up on our previous Twitter bio ideas post to get some help. In your profile, you can add a linkable website, your location and a 140-character bio that is linkable and respondent to hashtags and @mentions. Try to convey what your business or brand is about as succinctly as possible. Don’t go overboard with buzzwords or hashtags. You should make your Twitter bio clean and accessible. If you want to update the color scheme of your entire profile, there’s also a button for “Theme color.” Use a color that matches with your brand so everything seems uniform with your logo and company colors. Now that everything is ready, you’re set to start sending Tweets. Remember, each tweet only allows 140 characters (including Twitter usernames and links). This will help you keep your messages short and sweet, which is much of the allure to Twitter. Aim to be concise without getting too casual. Your business won’t look very professional if you use Internet lingo shorthand. Abbreviations like TBT (throw back Thursday) and ICYMI (in case you missed it) are perfectly fine for businesses to shorten their message. On the other hand, using words like “ur” for you are and “cuz” for because can seem unprofessional. 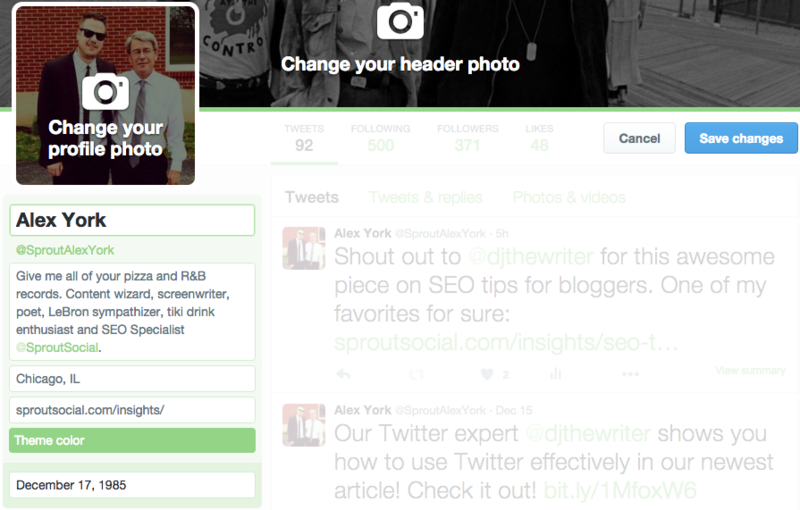 Twitter provides two sample posts that you can start with, complete with the #myfirstTweet hashtag. If you want to start with something more unique, you can compose your own first tweet in the text field below the samples. Hit the “Tweet” button and you’ll be off and running. One of the best things about Twitter is how well you can engage with others. You can do this by asking other users for Retweets, followbacks or answers to your questions. You also should continually Tweet from your profile. There’s nothing worse than a stagnant Twitter account, and simply put, you won’t get much interaction if you give little effort. Instead, try to schedule Tweets out each day and at specific times that work for your followers. Peak post times always seem to be up in the air, but with Sprout Social’s Viral Post feature, you can schedule Tweets to be sent at the time when your followers are most active on Twitter. It’s also good idea to be visual on Twitter whenever possible. This doesn’t mean you need an image in every single Tweet, but trends show more social media users engage with visuals than plain text. Engagement is all about communication. This is why it’s important to collaborate with other influencers. With the right connections, you can promote other brands on your profile to get shout-outs on their site. Generally you want to use Twitter to showcase your brand’s personality to connect with others. The more active you are on Twitter, the likelier you’ll engage with new users and gain a better following. Through these features, and many more, make sure you have a Twitter management tool you can trust and use to monitor your activity and engagement. Twitter is just like any other social network, it takes time to master. However, it doesn’t have to be a strenuous process to get out and start Tweeting. Remember, the most important key to being successful on Twitter is staying active. If you’re still worried about how to use Twitter effectively, take a look back at numerous posts about Twitter today!